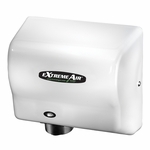 The eXtremeAir cPc hand dryer features our exclusive high performance cold plasma generator. The generator is 100% maintenance free, uses no chemicals and doesn’t create harmful levels of ozone. STANDARD FEATURES: Adjustable Sound & Speed A dial inside the dryer provides easy sound adjustment from 83 to 69 dB, with a speed of 19,000 to 10,000 LFM. There is NO need to upgrade or replace parts. Universal Voltage The eXtremeAir can be connected to any voltage from 100 to 240 volts, 50/60 Hz. The dryer configures itself to your voltage, making installation easier. Money Saver • Save up to 98% versus paper towel costs • Dry up to 100 pairs of hands for the cost of one paper towel. • Dry 1,000 pairs of hands for only $0.42 5-Year Premium Warranty Includes same-day factory repair or shipment of replacement parts. See owner’s manual for details. Green Certifications The eXtremeAir hand dryer has been GreenSpec® Listed. This is an unbiased list of the most environmentally friendly products published by the editors of Environmental Building News. 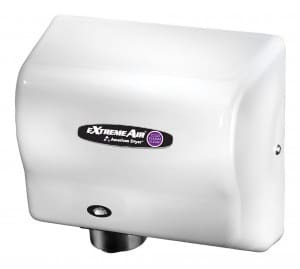 The eXtremeAir met tough GreenSpec standards because it uses 80-90% less energy than conventional hand dryers and reduces maintenance and waste. The eXtremeAir also helps facilities qualify for LEED Credits. Copyright © 2007 - 2011 Restroomremodels.com. ALL RIGHTS RESERVED.